A flashover is one of the most dramatic events that can happen in the dangerous world of firefighting. Once a room has burned for so long that it’s filled completely with smoke, the fire finally goes out. But that’s when it can be particularly dangerous. “If you have a room that fills up with gas, it basically doesn’t contain oxygen at that point. 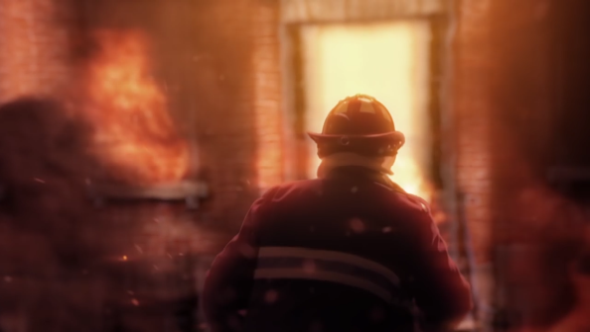 If you open the door then…” Firefighting Simulator’s creative and art director, Gregor Koch, pauses ominously. The explosions we witness in games are often triggered by a collision or scripted to happen just as we step into view. But in Firefighting Simulator, natural explosive phenomena like the flashover happen, well, naturally. It’s one of the results of the unparalleled fire simulation developers Chronos have put together. Here’s how it works. Read more: the best games of 2017 so far. Voxels are a technology most tend to associate with a previous era in PC gaming – namely the undulating plains of 1999’s Outcast. But they’re the same stacks of cubes that power Chronos’ fire propagation system. With access to Unreal Engine 4’s source code, Chronos have built a system that generates voxels for every piece of geometry in the game world. Simple walls, which don’t burn in a particularly complicated way, are assigned bigger, chunkier cubes – while staircases and sofas are made up of far denser collections of tiny voxels, the better to capture their complexities. The system is automated – it would be “really problematic” to fill every building with voxels by hand. 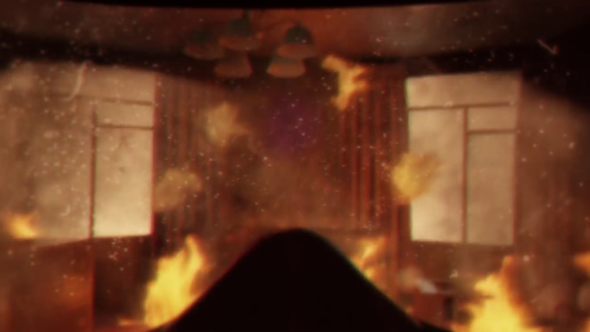 Chronos then use a brush-like tool they’ve developed for the Unreal Engine 4 editor to handle fine detail – painting a line for the flame to follow along the floor, for instance, to simulate the idea that an arsonist has spilled gasoline there. The studio’s level designers and artists can set what materials an object is made from, which in turn determines how it burns and whether it’ll break. If a part of the geometry is holding up something else, it can trigger a collapse. “When the fire simulation burns through the voxels, it will also at some point trigger structural damage,” Koch says. This separation of powers comes with a huge advantage: the fire propagation system doesn’t have to update 60 times a second, in line with the game itself. Instead it can update just five times a second, allowing for far more computation than if it were linked directly into Firefighting Simulator’s main thread. 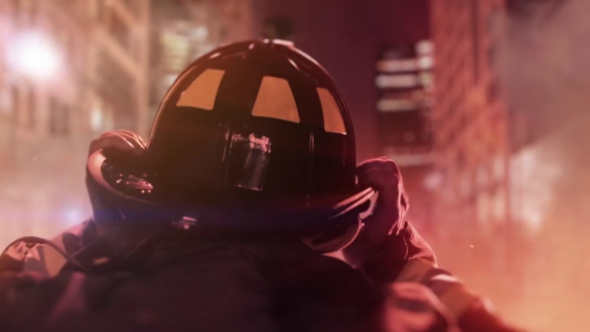 What’s shown on-screen will be only the information you need to make life-or-death firefighting decisions. “Currently the effects artists are really busy making the fire effects look better, and improving on how the [simulation] works with the visualisation for the player,” Koch says. Behind the scenes, the fire works its way through the simulation. It starts to claim the level voxel by voxel, travelling inexorably upwards in mimicry of real-life heat. 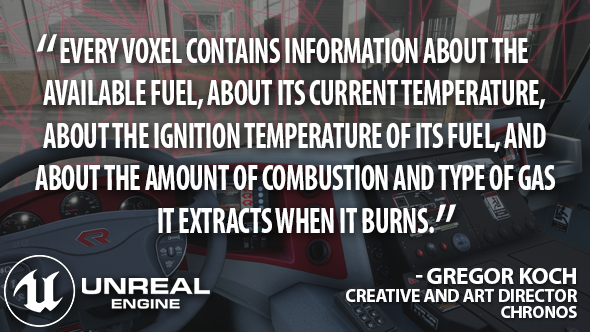 “Every voxel contains information about the available fuel, about its current temperature, about the ignition temperature of its fuel, and about the amount of combustion and type of gas it extracts when it burns,” Koch says. That’s important: a piece of wood might produce smoke, but a styrofoam object the same size could fill a room with toxic fumes much more quickly, with serious gameplay repercussions. And voila: a flashover. Of course, that’s hopefully something you can avoid when you’re saving the occupants of a burning building in Firefighting Simulator. 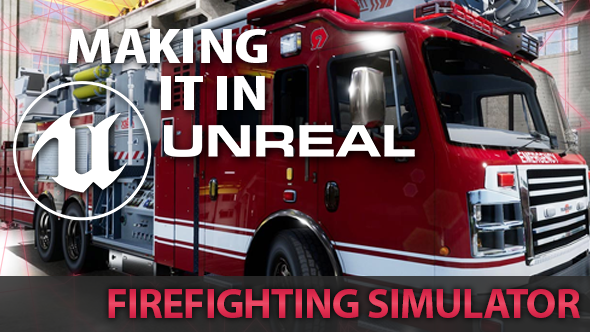 Firefighting Simulator’s Showroom mode is available for free on Steam. Unreal Engine 4 is free too. In this sponsored series, we’re looking at how game developers are taking advantage of Unreal Engine 4 to create a new generation of PC games. With thanks to Epic Games, Chronos, and Astragon.